For most of my life, I have considered myself a monogamous reader and writer. I’ll plow through one book at a time, no matter how painful or long it is. Occasionally exceptions would be made for short stories or poems I needed to read for class (one deals with these things often as an English major), but I would take novels one at a time. Then, grad school happened. Looking back now, I wonder how I was able to finagle it that I rarely had to worry about reading two novels simultaneously as an undergrad, but in grad school, I have found it is next to impossible to anticipate what you will end up reading for class. At first, I regarded this as a nuisance. My attention was constantly divided between two sets of characters, two plots, two sets of analyses. Was I enjoying the books less because I was reading more than one at a time or would I have dragged my heels through them anyway? Today, I finished the last of my books for class *cue the Hallelujah chorus*, and as I was drooling over my to-be-read pile, I wondered what else I was going to read. I have been dying to finish The Golem and the Jinni for months, yet I was already contemplating what other book I could read with it. Does this make me a poly-reader? From what I have noticed with my limited experiences, there are some definite pros and cons of poly-reading. Pros: More books! This year I decided to participate in the Goodreads Reading Challenge and decided my goal would be thirty books, and thus far, I have gotten through fifteen books in a little over four months. Plus, if one book is not holding your interest, you can always put it down for a little while and read the other. Cons: The plots, characters, etc. all become muddled. This is why I have avoided poly-reading for so long. My brain has a hard time juggling that many people, especially along with my own writing, but a solution I’ve found is that I can juggle one novel and one non-novel. This can be a book of poetry (usually for class) or a nonfiction book (typically marketing for me right now). It can also take you longer to get through your books because you’re continually bouncing between books and not finishing either one. For now, I cannot be sure how long this trend of reading two books at a time will last, but with one novel and one nonfiction book, it seems to work. Maybe it’s balance, maybe it’s a little ADD, or maybe I would rather do anything but my schoolwork and reading two books is a lovely excuse to avoid work. What about you? Do you read one book at a time or do you bounce between a few? Right now beside my bed there’s a nonfiction, a mystery novel I started and didn’t really get into, a fantasy (on a re-read), a fantasy (new), and a classic (Trollope, to be precise). I often read several books “at once”, but they’re different *kinds* of books – so I can have a nonfiction and a fiction, or a mystery and a classic. For fiction, I don’t usually read two at once, per se – more like I start one and don’t get into it, so I put it aside and read another one, and then get back to the first one later. I know what you mean. 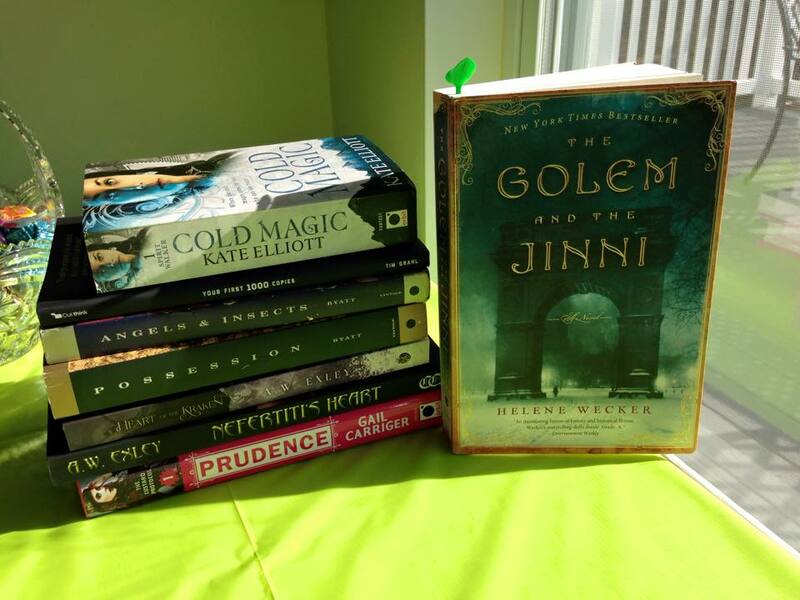 I’ve had The Golem and the Jinni on my “currently reading” list for months. It’s good but not super compelling. In between, I’ve read books for class, but I also read some very engrossing fiction. It’s definitely easier to balance a fiction and a nonfiction than two fiction books, especially if they’re somewhat similar.